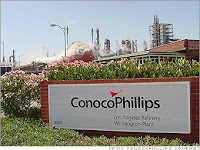 Check out this intriguing short article from the Fairbanks News Miner about Conoco Phillips stating it earned $1.54B in profits in Alaska last year. Let's read that figure again: that's one billion, five hundred and fifty four million dollars. $1,540,000,000. In profits. In Alaska. In one year. But wait--hasn't the oil industry been whining about how they can't make a buck anymore because of environmental protections, lowered production, declining oil availability, and fees, taxes, rents, and other costs? $1.54B in profits doesn't seem that bad. A conflict theorist would diagnose this issue as being about the conflict that is fundamental in societies. In this case, the conflict might be the oil industry and capitalists intent on controlling scarce resources versus consumers. Consumers--that's ordinary folks like you and me--must foot the bill and deal with the environmental devastation, job insecurity, and high pump prices that are the result of an industry that has politicians and government officials in their back pocket. In a classic case of conflict theory at work, one of the online forum commenters called the industry "greedy capitalist pigs." Some of the commenters on the Fairbanks News Miner forum are framing the issue differently. Structural functionalists, for example, would claim that vital industries that take risks--like the oil industry--have to have some incentives that encourage them to take risks. If the industry can't expect to make a healthy profit, the argument goes, it won't search for new oil fields. It won't invest in the structure and infrastructure. It won't employ workers. It wouldn't even BE in Alaska. And then not only Alaska, but nearly all Americans (and Asians) would be up the proverbial creek without a paddle. Remember that SFists say that all of the institutions in a society have to work together to ensure order and stability. In the SF view, oil corporations provide a resource that makes everything else in our economy possible--from the plastic drink container you have in your hand to the way you got to class this morning. Among the commenters, lakloey1's remark comes the closest to reflecting the way a structural functionalist would analyze the issue. Now, as yet another way to analyze the article and the comments, symbolic interactionists would have a field day with the performances here. Of course, as any fan of the Fairbanks News-Miner forums would note, the commenters perform quite a bit for each other. The regulars flame each other, trading snarky comments and insults. It's all performance, right? Each performer tries to establish an online identity through predictable interactions. As a regular reader, I have come to expect TheAlaskaCurmudgeon to come up with a witty remark that cuts to the heart of the issue. And I know that triproad will stumble over the facts and repeat lines overheard from rightwing talk radio and TV. So you can imagine my befuddlement if TheAlaskaCurmudgeon parroted something from rightwing talk radio. Or if triproad made a witty remark and got the facts right. As a regular reader, I would be confused because I have learned the online personalities of these two comments as being a certain way. I might worry that someone had hacked into their accounts and stolen their identities. There was a time, for example, during the past presidential election when there was a trio of commenters--SarahAmerica, AKReport, and Palin4Prez who astroturfed the News-Miner forum at every chance they got. I am not alone in believing that these three were the same person, BTW... Anyway, they became very annoying as they would have one-liner rah-rah Sarah Palin conversations on every article that even mentioned Governor Palin. Then suddenly, a person named SaraAmerica started posting anti-Palin comments. Huh??? The performance didn't match our expectations of SarahAmerica. She was playing an unexpected role and regulars like me were confused. It took some of us regulars a few hours to understand what had happened: someone ELSE had named themselves SaraAmerica (the "h" is missing) and had been posting. Back to the oil industry and Symbolic Interactionism. One of the commenters mentioned the advertising campaign, "Faces of ACES." I had never heard of it, so I googled it. Check it out: http://www.facesofaces.org/ The organization, The Alliance, is putting on a performance to get their message across. The "faces" are of ordinary Alaskans, ordinary working blokes (and gals) said to be negatively affected by ACES. But we had to have been socialized into understanding these kinds of faces as ordinary Alaskans. I must admit, though, that I'm a little confused by some aspects of the performances of these "ordinary" Alaskans. Where, I ask, are the Alaska Native people that make up 20% of our state's population? The black people? The Asian people? Aren't they ordinary Alaskans, too? A symbolic interactionist might diagnose my confusion as being the result of a botched performance by the ACES campaign. Thanks to http://i.cnn.net/money/galleries/2007/fortune/0704/gallery.500top50.fortune/images/05_conocophillips.jpg for the pix of ConocoPhillips' LA plant.